NORTH ROBINSON — Head coach Kyle Fenner (209-110 career record) will lead the Colonel Crawford Lady Eagles on the hardwood for the 2017-2018 season and will be doing so after the loss of many key elements from last year’s 11-12 (8-8 in the Northern 10 Athletic Conference, tied for fourth) team. The duo of Alexus Burkhart and Ashley Gwirtz graduated in the spring of 2017, leaving a combined 28.9 points per game void in the Lady Eagles offense. Burkhart finished last season as a member of the N-10 conference first-team and the District VI first-team. Gwirtz was a member of the second-team, all-conference squad a season ago. Abbi Teglovic (N-10 honorable mention), Taylor Webster, Abbie Bradshaw and Claire Ehmann also walked across the stage and received diplomas last spring. However, Fenner, joined by assistant coach Brian Fenner and junior varsity coach Kelsee Rehm, will bring back a trio of seniors and a junior to held lead the Crawford squad on what appears to be their uphill journey in ‘17-‘18. Seniors Lydia Strouse, Caitlin Koschnick and Kari Teglovic will be joined by junior Danielle Horsley as they look to anchor a young, Lady Eagles squad in the difficult N-10 season. Although the team may lack significant varsity experience, the coachable youngsters do possess a strong work ethic and the want to improve each day while constantly working hard. With the top of the N-10 looking to end similarly to a season ago (Upper Sandusky, Buckeye Central and Carey), the Lady Eagles will begin their regular season action on Friday, November 24 by hosting the visiting Northmor Lady Golden Knights. Conference play will begin on Tuesday, December 5 when the Carey Lady Blue Devils travel to Mac Morrison Gymnasium to clash with the hosting Crawford squad. 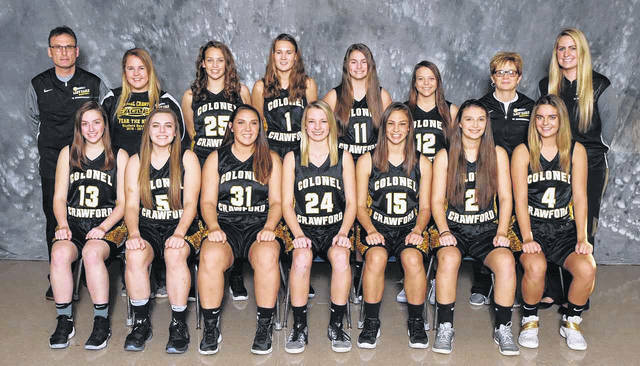 Photo by Photorama of Galion Colonel Crawford girls basketball team. https://www.galioninquirer.com/wp-content/uploads/sites/38/2017/11/web1_Girls-Basketball.jpgPhoto by Photorama of Galion Colonel Crawford girls basketball team.